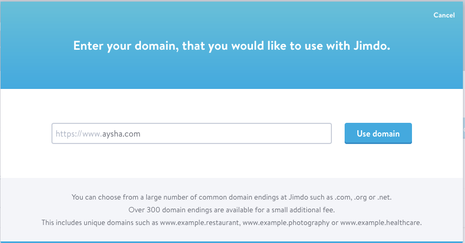 If you already own a domain that you purchased through an external domain registrar, you can use that domain with your Jimdo site. Connect the external domain but keep it with your current registrar. Transfer the domain to Jimdo. The first option, connecting your domain, is great if you appreciate having full control over your domain. Most standalone hosting companies give you access to the DNS, meaning that you can make changes to the domain settings at any time. Keeping the domain externally registered is also a good option if you manage several domains for multiple websites, including non-Jimdo websites, and want to keep them all in one place. Additionally, we recommend connecting your domain if for some reason your domain doesn't meet the requirements for a domain transfer (more on that later). Transferring your domain to Jimdo works great for people who like to have their domain and website in one place. Plus, since your domain is included in your Pro, Business and Platinum subscription, you won't have to pay the domain renewal fee if you transfer the domain to Jimdo. Keep in mind that the entire transfer process may take more than three business days. 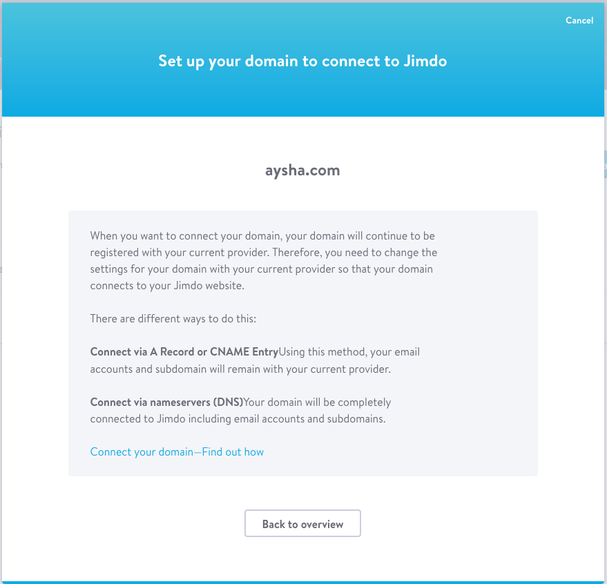 Your domain will only be properly connected to your Jimdo site once you’ve successfully completed both steps. Please note that it can take up to 24 to 48 hours for the changes to take effect and for your domain to become fully connected. When you click on 'Add a New Domain', you'll see two options to either register or connect a domain. Select the second option to connect your domain. Enter your domain name and then click on Use Domain. If you've already registered this domain with another domain registrar, you'll be asked to either transfer your domain or connect your domain. 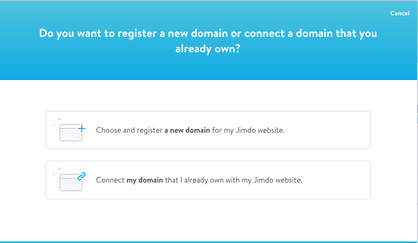 Select the option 'Connect my domain to Jimdo'. (see image below). When you click on it, you'll see the methods recommended by us to connect your domain to your Jimdo website. When you click on 'Back to overview', you'll see that your domain has already been added to your website. Now, the next step is to make changes to your domain settings. Read below to see the next steps. After adding your domain to your account, you will need to log in to your account on your domain registrar’s website. Access the domain settings and change the domain’s nameservers, change the domain’s A Record, or add a CNAME entry to connect your domain. If all that sounds like a foreign language, don't worry, we'll go through the steps below. Making this nameservers change will also change your email servers to Jimdo's. If you’d like to connect via nameservers but don’t want to use Jimdo webmail, you can configure custom email servers through Jimdo. Note: Changing your domain’s nameservers will disable existing email accounts you may be using with your domain. Make sure to back up any information you still need prior to making this change. You will be able to create new email accounts with the same name through Jimdo. Changing your domain’s A Record (IP Address) has no effect on existing services you may be using with your domain. 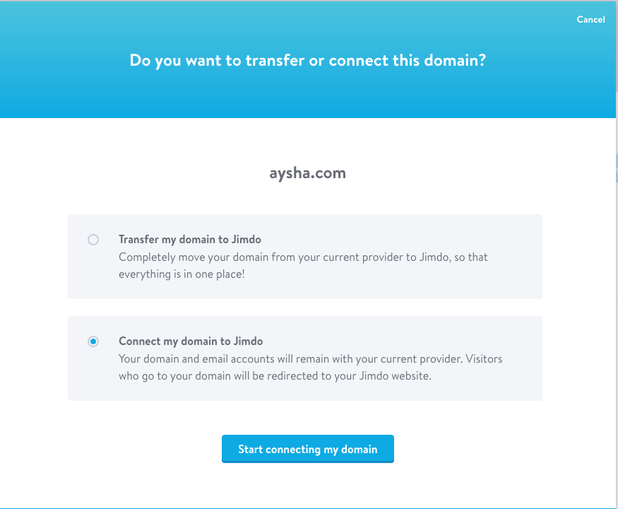 Connecting via A Record is a great option if you’d like to use your domain with your Jimdo website but also want to continue using services, such as email accounts or subdomains, through an external host. Adding a new CNAME entry to your domain settings has no effect on existing services you may be using with your domain. Connecting via CNAME entry is another good option if you’d like to use your domain with your Jimdo website but want to continue using services, such as email accounts or subdomains, through an external host. Note: When connecting via A Record or CNAME entry, make sure your www domain is pointing to your root domain, so that your website is reachable at www.yourdomain.com (with www) and yourdomain.com (without www). If you’re unsure about how to do this, ask your registrar to help you take care of this step. The domain needs to end in: .com, .net, .org, .biz, .info, .eu, .de, .at, .be, .co.uk, .ch .fr, .nl, .com.mx, .es, .it, .pl, .com.pl, or .se. Your domain needs to have been registered for more than 60 days. Why does your domain have to be older than 60 days? This is an ICANN standard for most domains. Not all domains are affected, so double-check with your domain registrar if you believe your domain may not be subject to a 60-day transfer lock. If your domain is not eligible for transfer yet, you are welcome to connect your domain in the meantime and transfer the domain to us once the 60 days have passed. 1. Log in to your Jimdo website to go to Settings > Domains & Emails > Domains. 2. Click on the Add a new domain button. 4. Enter your domain name. 5. Select the option Transfer my domain to Jimdo and then click on Start transfer. 6. Read through the information. If you have all the details with you then check the boxes for 'My email address is correct', 'I have my Authcode' and 'My emails are saved' and then click on Enter your Authcode. 7. 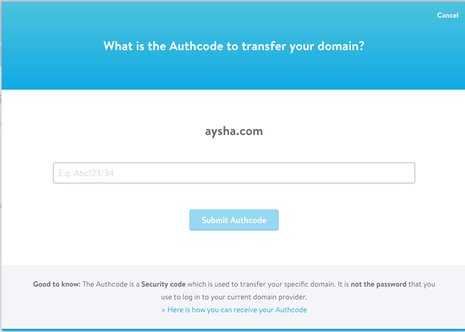 Enter the Authcode for your domain. Then click Submit Authcode. 8. Fill out the domain contact information form and confirm that you'd like to transfer by clicking on Start Transfer. Check your domain owner details and ensure that your email address and owner information is up-to-date. If any information is outdated, contact your domain registrar and ask them to make any necessary changes. Make sure you set an email address that you personally have access to as your administrative contact (AdminC) email! Otherwise you won't receive the confirmation emails that you'll need to complete the transfer. Back up your domain-associated email accounts (name@yourdomain.com) prior to starting the domain transfer. 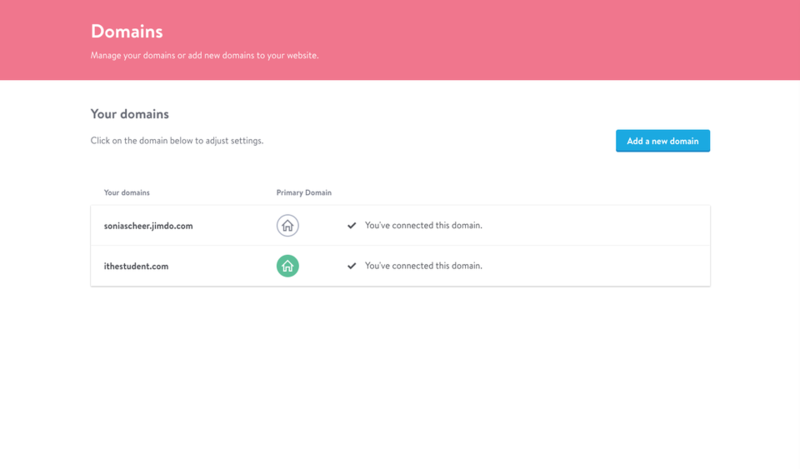 After the domain is transferred, you can either reconnect your email accounts to your previous host, or create new email accounts with us (you can use the same addresses). Contact your current domain registrar and ask them to unlock your domain and send you the auth code needed to transfer the domain. 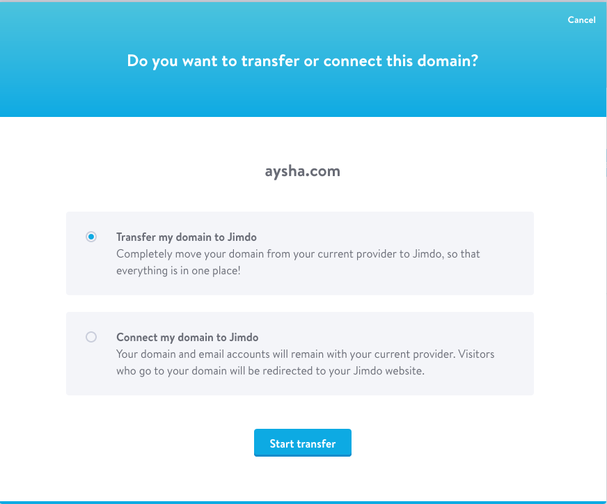 Log in to your Jimdo website and go to Settings > Domain & Emails > Domains, then click "Connect Domain" next to the domain that you want to transfer. 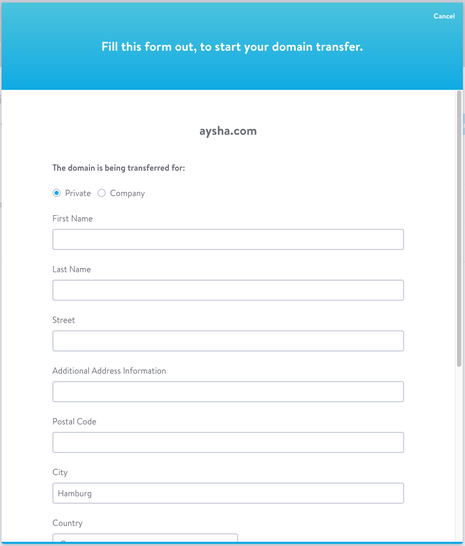 Complete the domain contact information form and confirm that you'd like to transfer your domain. Wait for an email from your current domain registrar to arrive in your inbox. Confirm the domain transfer via the link in that email to start the actual transfer. If you don't confirm the domain transfer, the current domain registrar starts the transfer automatically after 5 days. Typically it only takes 1-3 business days. You'll receive an email from us with a confirmation once your domain has been successfully transferred to Jimdo. Contact our Support Team from the email address we have on file for your account. Tell them the name of your Jimdo website (e.g. yoursite.jimdo.com) and let them know which domain you'd like to transfer. Wait for us to get back to you with a confirmation that we've added your domain to your account. Back up your domain-associated email accounts (name@yourdomain.co.uk). 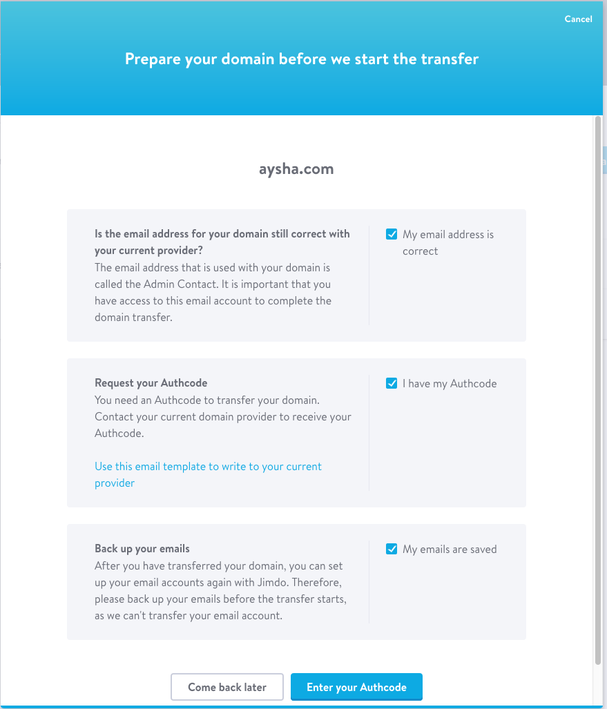 After the domain is transferred, you can either reconnect your email accounts to your previous host, or create new email accounts with us (you can use the same addresses). Go to your current domain registrar's website and log in to your account. Select the domain you'd like to transfer out. We'll take care of the rest, and of course we'll keep you updated about the progress of your domain transfer. Confirm with your current registrar that the domain owner (admin-c) email address is up-to-date. After we start the transfer with nic.at, you will receive an email with a link. Click on the link to confirm the transfer. We will send you a confirmation email once the transfer is complete. Make sure you are using an email that you have access to as your administrative contact (AdminC) email! If WHOIS privacy is activated for you domain, make sure to disable it before starting the domain transfer. Contact your current domain registrar and ask them to unlock your domain and send you the auth code (some domain registrars call it the EPP code) needed to transfer the domain. Contact our Support Team from the email address we have on file for your account. Tell them the name of your Jimdo website (e.g. yoursite.jimdo.com), let them know which domain you'd like to transfer and make sure to include your auth code. You'll receive an email in your admin-c email. Follow the instructions in this email to verify the domain transfer. If you don't receive this email within 24 hours, contact our Support Team. Your registrar will have up to 10 days to complete the transfer. Typically it only takes 1-3 business days. You'll receive an email from us with a confirmation once your domain has been successfully transferred to Jimdo.